The recent experience of Santander Teleport (http://santanderteleport.com) in Santander, Spain, is an example of how purchasing used TWTAs equipment can save time and money, and at manageable risk levels. 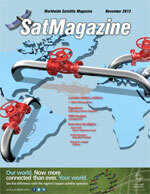 Santander Teleport offers commercial and government organizations access to C-, Ku-and X-band services to satellites in the GEO orbit from 60 degrees West to 65 degrees East, covering a region from Western Australia to North America, the Mediterranean Sea, as well as the Indian and Atlantic Oceans. According to Mónica Delgado, Technical Director for Santander Teleport, “Many customers request services that need to be on air very quickly. Sometimes, manufacturer delivery times for new RF equipment are too long to allow us to commit to our customers’ requested in-service dates.” When this has occurred, Santander Teleport has found success by taking quick delivery of pre-owned TWTAs that are shipped from New Era Systems (www.newerasystems.net). New Era Systems is a company that specializes in providing deep discounts and fast worldwide delivery of used equipment that ranges from large and small satellite antennas, modems, VSATs, BUCs, transceivers, amplifiers and more. Quick delivery can certainly be important. However, the costs savings achieved with pre-owned gear tend to be the key factor when considering used equipment. Consider the following typical and actual example where a buyer experienced a 50 percent price savings. Ku-band solution of at least 400 watts with a fully automatic switch-over in case of a failure of the operating amplifier. The customer had no preference for either a TWTA or SSPA and wanted a quote for the most reliable and cost effective solution. The price quotes for new Ku-band and extended frequency amplifiers are show in Table 1, below. The customer saved $50,000, while gaining an additional 300W of power in each of two amplifiers in the 1:1 system, with years of service remaining on the equipment. According to manufacturers, TWTAs can operate for 100,000 hours (more than 11 years) of continuous service at their rated RF output power.1 How does one assess the risk versus benefit when it comes to buying a used TWTA? As engineers are fully aware, the heart of a TWTA is the tube. When the tube reaches life’s end, the cost of a replacement tube can range from $17,000 to $27,000. As a buyer, it is vital to know the condition of the tube in the amplifier under purchase consideration. Fortunately, there are some good parameters that offer clear intelligence about the condition of the tube. Manufacturers’ statements say that the vast majority of TWTAs live up to, and past, their planned lifetimes. Cooling fans and power supplies are likely to fail first, before the tubes fail.2 There are electronic control circuits in TWTAs that age, and, eventually, deteriorate. “Each manufacturer has its own expiration guidelines—most manufacturers recommend about 45,000 hours of use on a TWTA. Although a manufacturer may specify a set number of hours of operation as the ‘expiration date’ for the unit, that date may not reflect the capabilities of the HPA to continue to provide reliable service,” said Thomas. To be fair to TWTA manufacturers, the hours of operation are obviously important as a TWTA does not run by tube alone. However, failure of the control circuits is normally not the catastrophe that would be caused by a complete tube failure. “We have purchased and resold amplifiers with as many as 90,000 hours on the meter. And yet, with good tube characteristics, they can be expected to last for many more years,” added Thomas. Even if the heater hours (total time operated) indicator reports 80,000-90,000 hours, the actual Beam On hours for the specific tube could be much lower. It may have been a replacement part that was installed later than the first tube initially shipped from the factory. A good practice is to ask a used equipment suppliers what testing they perform, and what guarantees are offered on the items they ship. Does your supplier perform diligent testing to ensure the unit is in good condition and can be predicted to deliver the expected performance for the planned term of use? “We believe that our industry-leading quality testing, and refurbishment services, and resale guarantees, are key part of why ground station facilities worldwide have continued to rely on New Era Systems as a trusted supplier of pre-owned RF gear over two decades,” said Thomas. Know your supplier. Be sure that they will support their sales—if it is necessary to go back to the manufacturer for help, that can be a costly and time consuming necessity. When a used TWTA is purchased, it is essential the equipment be properly commissioned into service. Manufacturer’s safety precautions exist for storage, set-up, testing, and operation of TWTAs and their components, all of which should be observed. For example, CPI (Communications & Power Industries) has published a guide that discusses out-gassing the tube and then only increasing the output power gradually over several hours. Photo of a Xicom 100W Rack Mount C-Band TWTA. Courtesy of New Era Systems. Tube amplifiers demand a certain amount of skill on the part of the user. Turning them on, and immediately cranking up the power is a prescription for failure. TWTAs have a long warm-up time, especially if they have been turned off for a protracted period. Make sure you have the proper instructions for the unit and follow the correct procedure for placing your pre-owned TWTA into use. “It is not unheard of in our business that customers have turned on a used HPA without following proper instructions, and they immediately burned out their tube by applying too much power without adequately warming up the system,” states New Era Systems. Also, if an amplifier is run in a dirty environment, the cooling fans ingest grime that gathers on the surface components, preventing efficient cooling of those components and most likely causing early failure. Another killer of the tube is dirty AC power. 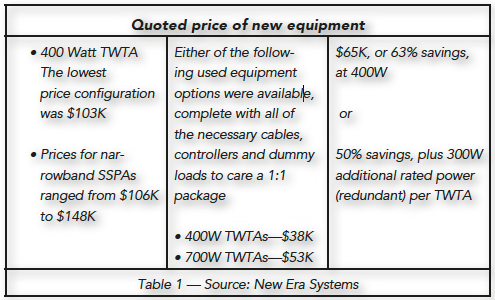 Pre-owned TWTA buyers who connect them directly to utility power sources or generators without the protection of a good quality UPS between the generator and the amplifier are also destined to shorten the life of the tube. Power spikes can scrub an HPA as well. It is essential to have the properly conditioned and surge-protected power and the prescribed grounding for the installation. Careful packing is also essential to avoid shipment damage. Make certain the supplier properly packs the equipment prior to shipping—ask for test data documentation before shipment. When you stand to save more than 50 percent in cost, the pre-owned TWTA option makes business sense for a variety of situations. Although an occasional deal for satellite gear can be found on eBay, savvy buyers and sellers say your best bet for used TWTAs is to work with an experienced, reputable supplier, one that follows test procedures and provides delivery and performance assurances that can be relied upon. 5Source: Howard Hausman, VP Engineering, MITEQ, Inc. ,”A Comparison of High Power Amplifier Technologies: TWTAs vs SSPAs”, MPDigest.com, January 2008, Page 1. Article states that tubes have a typical life limited to 70,000-100,000 hours of continuous operation. 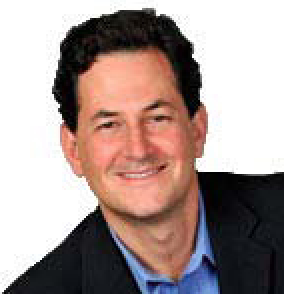 Dan Freyer is the principal of AdWavez Marketing (www.adwavez.com), an agency focused on providing marketing services to the satellite industry. He can be reached at dan@adwavez.com. He has helped top satellite manufacturers, operators, service providers, equipment suppliers, and associations develop their businesses for over 20 years. He is the author of Liftoff: Careers in Satellite, the World’s First and Most Successful Space Industry (SSPI 2010), and is a contributor to The Satellite Technology Guide to the 21st Century, among numerous other industry publications.